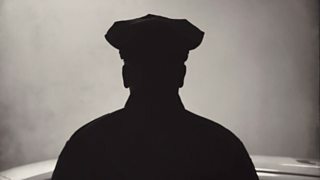 In this poem, MacCaig portrays the imposing presence of a New York policeman. In doing so, MacCaig considers the fragile nature of society and the challenges that it can pose. First published in MacCaig’s 1968 Rings on a Tree collection, Brooklyn Cop is, like Hotel Room, 12th Floor, inspired by a trip to New York. New York City is made up of five boroughs. Of these, Brooklyn has the largest population. At the time it was considered a tough and dangerous place. At the time the poem was written, the behaviour of the police in the USA had been called into question. Images of brutal and violent behaviour from the police in response to civil rights protests and demonstrations had been shown around the world. The poem focuses on one particular character, an un-named Brooklyn police officer. The policeman is imposing and strong, even threatening, but we also see him as being vulnerable and human. His exchanges with his wife underline the severity of the dangers that he faces each day. However, this poem is not a character sketch. It concerns the dangerous and violent world that policemen in New York, or anywhere in the world can face. By portraying the cop as both a threatening animal and as a vulnerable human being, MacCaig questions how civilised modern society is and suggests the dehumanising nature of violence. Although the policeman is imposing and strong, we also see him as being vulnerable and human. His exchanges with his wife underline the severity of the dangers that he faces each day.